It's Friday and if I could, I'd be off on a weekend getaway. I miss cabins in the mountains... being able to star gaze and slow down a bit. At Lost River Modern in Lost River, West Virginia, it would be easy to do just that. In style, of course. 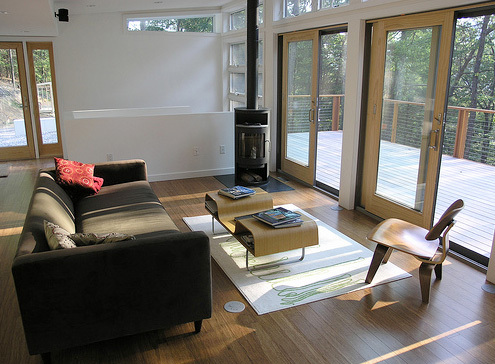 This is a spacious, modern cabin with lots of big windows to bring in the light and trees. It's designed by Resolution: 4 Architecture, the creators of incredible, jaw dropping abodes, including the original Dwell Home in Pittsboro, North Carolina. This cabin has a master bedroom, bath and living space on the upper level and downstairs you'll find a second bedroom, bath and media room. All of which is beautifully designed and decorated. You have to appreciate that in a mountain cabin. They wanted the home to feel as spacious as the five acres it sits on. 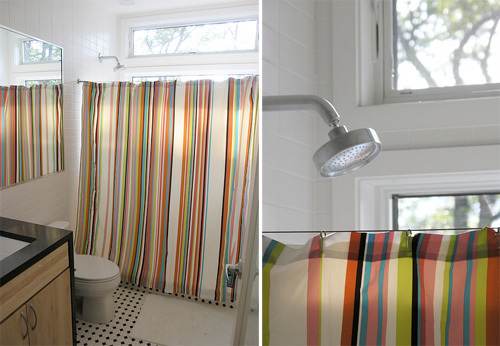 A pop of vibrant color can be found in each and every room along with the light woods and bamboo flooring. I love that, it makes the space so cozy and inviting. This cabin is actually a prefab cabin, which means it was built off site. 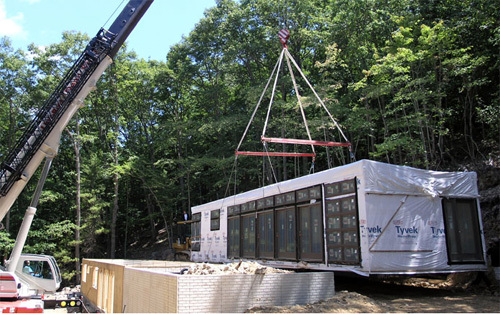 The basement level was built first, then the 64' x 16' prefab module was hauled into place via a large crane. As they say on their site, We were "determined to prove that modern prefab can be both specatacular and affordable." With a budget just over $350,000, I think they've accomplished that and then some. If you'd like to read more details about the build, check out their extensive blog on the project. The home is a two hour drive from Washington DC, so find out the rental availability and book a weekend trip. The nightly rate starts at just $200- would be great for a girls weekend or a romantic getaway. You deserve it, don't you think?